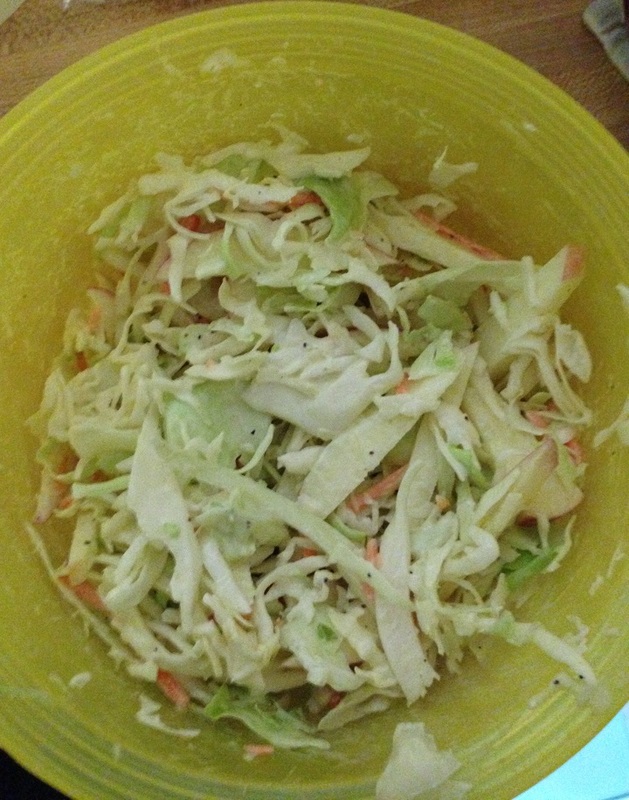 A great side dish for the warm weather when you are having a barbecue, picnic, party, buffet or just want a lighter and refreshing side is coleslaw. There are so many different things that you can do and ingredients that you can use to make a coleslaw that your options seem almost endless. Even better, with the bags of coleslaw mix that are available in most grocery stores today you do not have to go through the effort of shredding cabbage and carrots on your own (unless you want to of course). Many times during the summer these bags of coleslaw are on sale at my store for a dollar a bag or less, which makes them a great deal to buy. I have tried a bunch of coleslaw recipes in the past and am always on the lookout not just for something new, but one that uses little or no mayonnaise at all. I found this recipe on Kitchen Daily for an apple coleslaw and made a few modifications to make it my own. In a large bowl, combine the green cabbage, red cabbage, julienned carrots, or the 1 bag of coleslaw mix (whichever you happen to be using) and the julienned apple. In a large glass measuring cup, whisk together the mayonnaise, the olive oil, the apple cider vinegar, lemon juice, the poppy seeds (if using) and the salt and pepper to taste. Pour the dressing mixture over the cabbage mixture and stir everything together using a rubber spatula. Stir until everything is well combined. Cover the bowl and place it in the refrigerator for at least one hour so that the flavors can meld. Serve the coleslaw cold. Personally, I left out the poppy seeds because I didn’t have any on hand and I didn’t think they would add that much to the dish. While they will look nice and add some texture, it just wasn’t for me this time. I loved the freshness that the apple added to the mix with the cabbage and carrots and since there was very little mayonnaise it didn’t get all watery as it chilled. I think you could probably eliminate that mayo all together if you wanted to go without it and just stick with the olive oil, but the mayo does help to bind everything together nicely. You could certainly try substituting yogurt or sour cream for the mayo as well. I used Gala apple for mine but I think you can use whatever apple you like the best for crispness and flavor. The original recipe called for Granny Smith, which I find to be very tart so I opted to change that out. in any case, I think it was a great coleslaw with excellent flavor that is a great side dish for burgers, hot dogs, ribs, chicken, sandwiches or just about anything else you can think of for a summer meal. I had made some classic chicken fingers not that long ago along with some homemade dipping sauces and the grocery store was having a really good sale on chicken tenderloins so I picked up another batch of them and was looking for something else to do. Sure, I could have just cut up the chicken and used it for something like a stir-fry or a warm chicken salad, but I wanted to try something else with chicken fingers again. Lo and behold along came the newest issue of Cook’s Country magazine in the mail shortly after and in it was a recipe for pretzel-crusted chicken fingers. I thought this was a good one to try to see if I could get some extra crunch and flavor out of the chicken. The recipe is very simple and only takes a few minutes to make, so you can easily make this anytime you want some chicken fingers. Process the pretzel sticks in a food processor until they are finely ground, about 20 seconds. you should end up with about 1 1/2 cups of pretzel crumbs. Transfer the pretzel crumbs to a shallow dish. Spread the all-purpose flour in a second shallow dish. Beat the eggs and the Dijon mustard in a third shallow dish. Pat the chicken dry with paper towels and season it well with salt and pepper. Dredge the chicken pieces in the flour, shaking off any excess. Then dip the chicken pieces in the egg mixture, allowing any excess to drip off. Finally, dip the chicken pieces in the pretzel crumbs, pressing on the chicken gently in the crumbs so the crumbs adhere well. Heat 3 tablespoons of the vegetable oil in a large nonstick skillet over medium-high heat until the oil is shimmering. 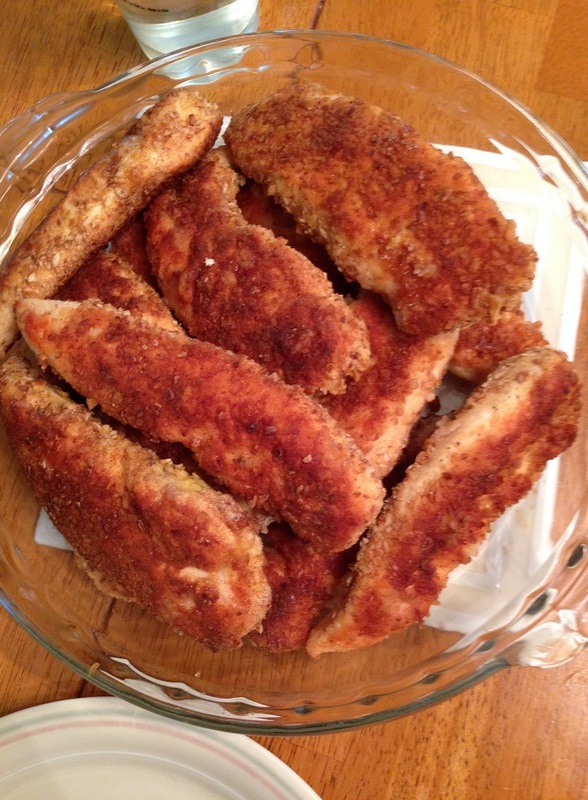 Cook half of the breaded chicken tenderloins until they are golden brown and cooked through, about 5 minutes per side. Adjust the heat along the way if the crust seems like it is beginning to burn. Transfer the chicken fingers to a paper towel-lined plate, discard the oil, and wipe out the skillet with paper towels. Repeat the process with the remaining 3 tablespoons of vegetable oil and the remaining chicken tenderloins. Serve the chicken fingers with your favorite dipping sauces. You want to make sure you use the thin pretzel sticks for this recipe and not the thick pretzel rods. The thin pretzels will grind easier and are not as dense and hard as the rods, giving you better crumbs for the crust. You get a really nice flavor from the pretzel crust and just a hint of the Dijon mustard along the way to give them great flavor. This is a great recipe to offer up for the kids who love chicken fingers but want something a little different or as a quick dinner or to serve at a party. You can make large batches of them and freeze them cooked for later use at another time. Nearly everyone loves to eat fried chicken. It seems to be a particularly great dish as the weather gets warmer and you can incorporate it into your outdoor parties and picnics, but it is also a great dish that you can try just on a weekend or weeknight. 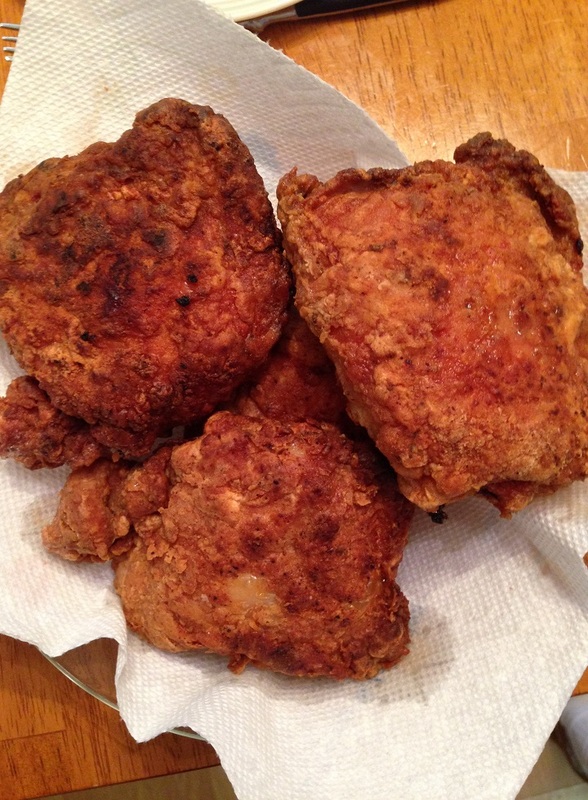 While there are thousands of variations on fried chicken and everyone seems to have their own best method or family recipe for making it, I came across this recipe in the latest issue of Cook’s Country and thought it sounded unique enough that I wanted to give it a try. It is for Latin fried chicken and takes the basics of fried chicken and incorporates some Latin spices and flavor to give things a little bit of a different taste for you. For the marinade: Combine the salt, garlic, pepper, cumin, smoked paprika, oregano, and the lime zest and lime juice together in a bowl. Add the chicken pieces and turn the chicken to coat it thoroughly with the marinade.Cover the bowl with plastic wrap and refrigerate the chicken for at least 1 hour and up to 2 hours. For the coating: Whisk the flour, cornstarch, pepper, granulated garlic, baking powder, white pepper, salt, cumin and cayenne pepper together in a bowl. Place the beaten egg whites in a separate shallow dish. Set a wire rack in a rimmed baking sheet. Remove the chicken from the marinade and scrape off any of the solids from the marinade from the chicken. Pat the chicken dry with paper towels. Working with one piece at a time, dip the chicken in the egg whites to thoroughly coat the chicken, letting any excess drip off back into the dish. Dredge the chicken in the flour mixture, pressing on the chicken piece to get the coating to adhere well. Transfer the chicken to the prepared wire rack and refrigerate the chicken for at least 30 minutes or up to 2 hours. Add the vegetable or canola oil to a large Dutch oven until it measures about 2 inches deep and heat the oil over medium-high heat until it registers 325 degrees on a candy thermometer. Add half of the chicken to the hot oil and fry the chicken until the breasts register 160 degrees and the thighs.drumsticks register 175 degrees on an instant-read thermometer, about 13 to 16 minutes. Adjust the burner, if necessary, to maintain an oil temperature between 300 and 325 degrees. Transfer the chicken to a clean wire rack set in a rimmed baking sheet.Return the oil to 325 degrees and repeat the process with the remaining chicken pieces. Serve. One thing about when you marinate the chicken – you don’t want to leave the chicken longer than 2 hours in the marinade. The lime juice in the marinade will start to toughen up the chicken, so you should try to get it before the 2 hour mark passes. You can really taste the lime, garlic and spices in the chicken and the coating comes out perfectly crispy. Adding the cornstarch and baking powder to the flour really makes a big difference in the results. I only made 4 pieces of chicken when I tried the recipe, so I cut everything in half for a smaller batch, but you can easily make a big batch of this to serve for a party or a picnic. This chicken would go great with all kinds of side dishes and it is just as good the next day. I would love to have a great steakhouse meal now and then, but the steakhouses in New York City (which is about 45 miles away from us) are just too expensive and there just are not very many quality steakhouses in the area that we live that are affordable to the average family anymore. Sure, it’s a treat to go out and have a nice dinner once in a while, but it is also great if you make something similar to that experience all on your own at home and without the benefit of having a gas or charcoal grill to use. Even with a good grill, you never are really going to get the same type of steak you get at a good steakhouse unless you are spending a fortune for some quality aged beef and have a professional-grade oven that can get the heat cranked up to 800 degrees to get that great sear you need. So for the rest of us, there are still options to get a great meal for yourself. The New York Times recently had an article in their dining section regarding making a good steak at home and it can be a lot easier than you think with this recipe. It just takes some time and paying attention and you can make your own great steak and potato meal. Preheat the oven to 450 degrees. Set a large pot filled with salted water on the stove. Add the potatoes, turn the heat to high and cook, gently boiling, until the potatoes are softened, about 12 to 15 minutes. Drain the potatoes and dry them well. Oil a sheet pan with half of the canola oil and put the potatoes in the pan in a single layer. Using a potato masher or the bottom of a heavy glass, gently smash each potato, pressing it down to a thickness of less than 1 inch. Drizzle the rest of the canola oil over the smashed potatoes and place the sheet pan on the top rack in the oven and allow them to roast until the exteriors are golden and crunchy, about 20 to 25 minutes. Add salt to taste. For the butter, place the butter on a cutting board and, using a fork, cut the thyme, shallot, lemon juice and vinegar into the butter until the butter is creamy and smooth. Scrape the butter together with a chef’s knife and form it into a rough log. Roll the butter tightly into a sheet of plastic wrap and refrigerate until you are ready to use it. As the potatoes finish crisping, make the steaks. Set a heavy-bottomed skillet (or 2 if your steaks are very large) over high heat and let the skillet sit for a few minutes until it gets very hot.Pat the steaks dry with paper towels to absorb any exterior moisture. Shower the steaks aggressively with salt and pepper on both sides. Add the canola oil to the pan and shake the pan to distribute the oil evenly. The oil should almost immediately begin to smoke to let you know the pan is ready. Place the steaks in the skillet and allow them to sear, unattended, for 4 minutes, until they have developed a good crust on one side. Turn the steaks over and cook for an additional 3 to 6 minutes for medium-rare. Remove the steaks to a warm platter to rest. 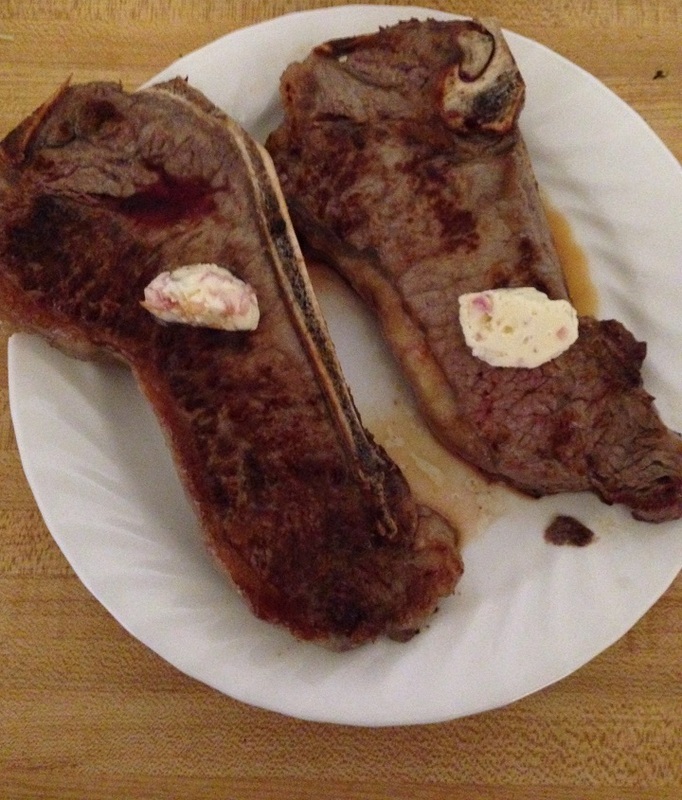 Top each steak with a tablespoon of the compound butter. 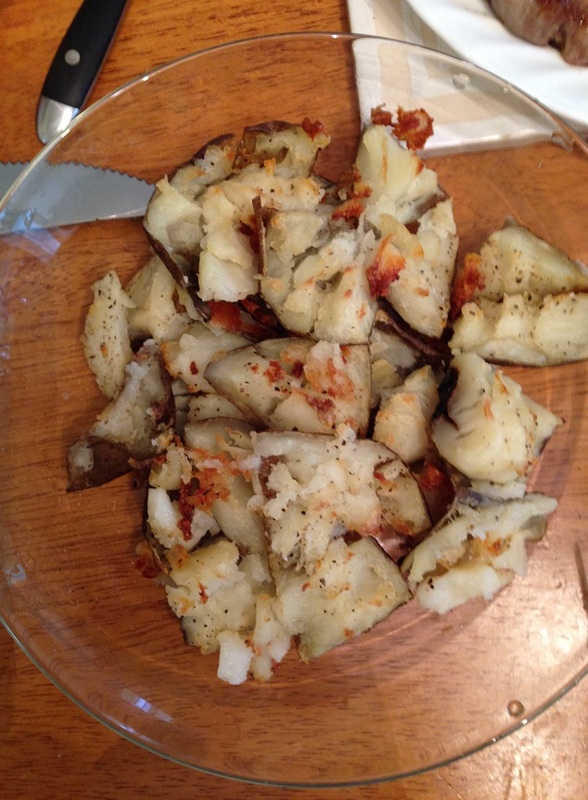 Remove the potatoes from the oven and season them with salt and pepper to taste. Place 2 or 3 potatoes on each plate alongside a steak. Top each steak with pats of the butter and serve. You really need to make sure your pan is very hot before you put the steaks in to make sure you can get a good crust. You also want to make sure you have gotten rid of any surface moisture from the steaks so they are not just steaming in the skillet but cooking to get a good sear. The steaks came out perfectly (of course you can always cook them longer to your particular liking, just keep a close eye on them so they don’t overcook) and the potatoes were perfect, crisp and crunchy just the way I like them. I used New York strip steaks since that is what was on sale when I got steaks and they worked out well. You can serve this with any traditional steakhouse recipe, like creamed spinach or asparagus, and having some nice bread to go along with it or some dinner rolls can really round it out for you. 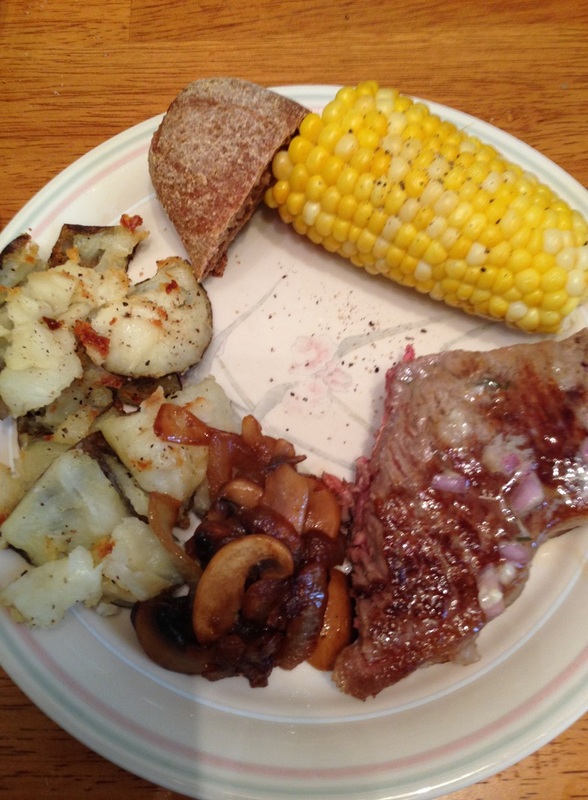 I made some corn on the cob and sautéed some mushrooms and onions to go along with the meal and used some of the steakhouse bread I had in the freezer. The butter is great not just on the steaks but on everything else you might serve as well. There are a lot of great side dishes you can make when you are cooking for outdoor meals, barbecues, pool parties, summer graduations, buffet meals, picnics and general outdoor get-togethers. There are always options for potato salad, coleslaw, fruit salads, green salads and more, but one of my personal favorites is baked beans. Baked beans can pretty much go with any type of meal, and seem to go really well with all kinds of barbecue, whether it is ribs, chicken, burgers and hot dogs or just about anything else. 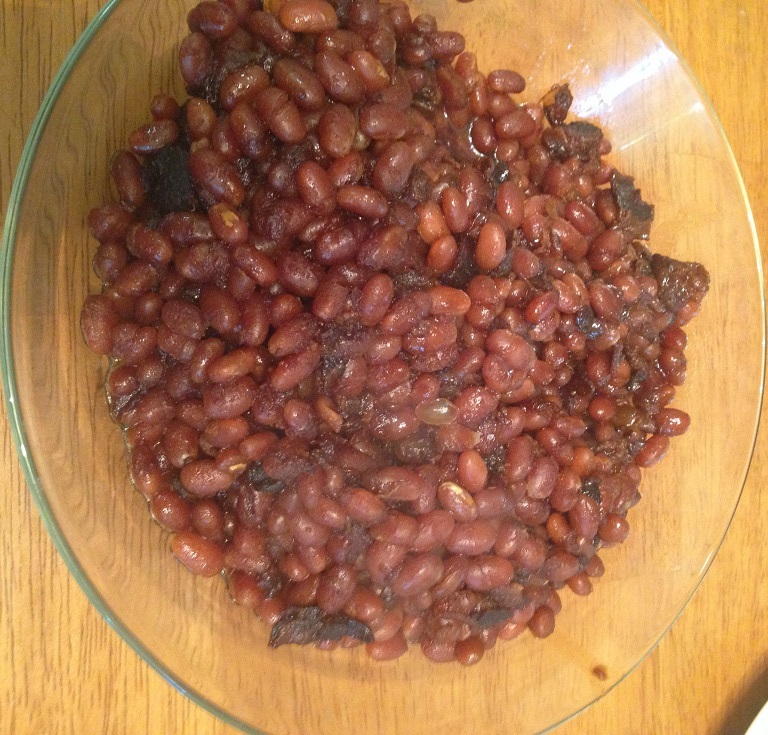 I have tried a variety of baked bean recipes and posted a few of them right here on this blog, but one that I always seem to go back to is this one from America’s Test Kitchen for Boston baked beans. It’s simple and delicious and gives you that deep flavor you want. Adjust an oven rack to the lower-middle position; heat the oven to 300 degrees. Add the salt pork and the bacon to an 8-quart Dutch oven; cook the pork and the bacon over medium heat, stirring occasionally, until they are lightly browned and most of the fat is rendered, about 7 minutes. Add the onion and continue to cook, stirring occasionally, until the onion is softened, about 8 minutes. Add the 1/2 cup of molasses, the brown mustard, the beans, 1 1/4 teaspoons of salt, and 9 cups of water; increase the heat to medium-high and bring the mixture to a boil. Cover the pot and set the pot in the oven. Bake until the beans are tender, about 4 hours, stirring once after about 2 hours of cooking time. Remove the lid from the pot and continue to bake the beans until the liquid has thickened to a syrupy consistency, about 1 to 1 1/2 hours longer. Remove the beans from oven; stir in the remaining tablespoon of molasses, the apple cider vinegar, and the additional salt and pepper to taste. Serve. You really want to use dried beans for this recipe. Canned beans cooking this long will just get very mushy on you and lose all of their texture and consistency (besides, dried beans are pretty cheap, usually about 75 cents for a 1-pound bag). This recipe makes a lot of beans, as most beans recipes seem to do, so it is great if you are cooking them for a crowd at a barbecue. if you want to just make them for a smaller, home crowd or family, you can do what I did this time and cut the recipe in half. you’ll get a good portion of beans for your meal and still have leftovers to use for other days. You get great flavor from the bacon and salt pork with just a hint of the brown mustard and the molasses and vinegar both really help to build the overall flavor of the dish. This one is a family favorite for us and we make it a lot, especially in the summer or to bring over to a party. That’s all I have for today. Check back next time for another recipe. I hope you enjoy your Memorial Day weekend and remember to take the time to thank a veteran today and remember those who have given so much to help the world through their sacrifice and commitment. Enjoy the rest of your day and enjoy your meal! Since I don’t have the advantages of having a charcoal or gas grill it sometimes feels like it can really limit some of the things I can cook, particularly when it comes to making ribs. I have been able to find some great recipes for making ribs in the oven and they have turned out well, but I am always looking to see if there is something new I can try to get even greater flavor out of a meal of ribs. 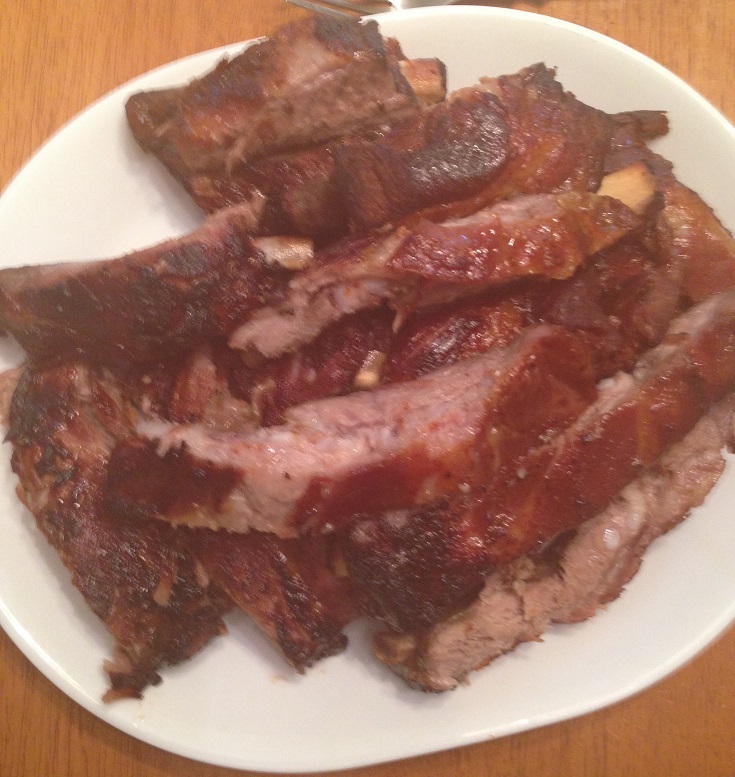 I came across this recipe awhile back from Kelsey Nixon on the Cooking Channel for Asian barbecue ribs that are made in the slow cooker, which makes them perfect for you to try for a weeknight meal when you want something ready for you when you get home from work. These are very easy to make, with just a few ingredients that go a long way to giving you some great flavor. Heat the sesame oil in a large saucepan over medium-high heat. Saute the ginger, garlic and green onions until all are fragrant, about 1 minute. Add the brown sugar, chili sauce, soy sauce, rice wine vinegar, honey and 1/2 cup of water. Whisk the mixture until everything is fully incorporated. Bring the mixture to a simmer over medium-high heat, stirring occasionally. Continue cooking until the sauce has thickened, about 5 minutes. Remove the sauce from the heat and allow it to cool. Sprinkle the ribs generously with salt and pepper and place the ribs in an upright position in the slow cooker. The meaty side of the ribs should be facing outwards. Spoon the sauce over the ribs and cover the slow cooker. Cook the ribs in the slow cooker on high for 3 to 4 hours or on low for 6 to 8 hours. Strain the sauce from the slow cooker into a saucepan and remove any accumulated grease from the top of the sauce. Combine 1 tablespoon of water with the 1 tablespoon of cornstarch and whisk them together in a small bowl. Add the cornstarch mixture to the saucepan and bring the sauce to a boil over medium-high heat. Reduce the sauce until it has thickened and serve it with the ribs. I actually added one more step to this recipe at this point. When I removed the ribs from the slow cooker, I put some of the reduced and thickened sauce onto the ribs and then placed the ribs under the broiler for about 2 minutes to really get a nice glaze and crisp up the ribs some more. I think this made a big difference as far as flavor, texture and look of the ribs and I would do that again with this recipe. 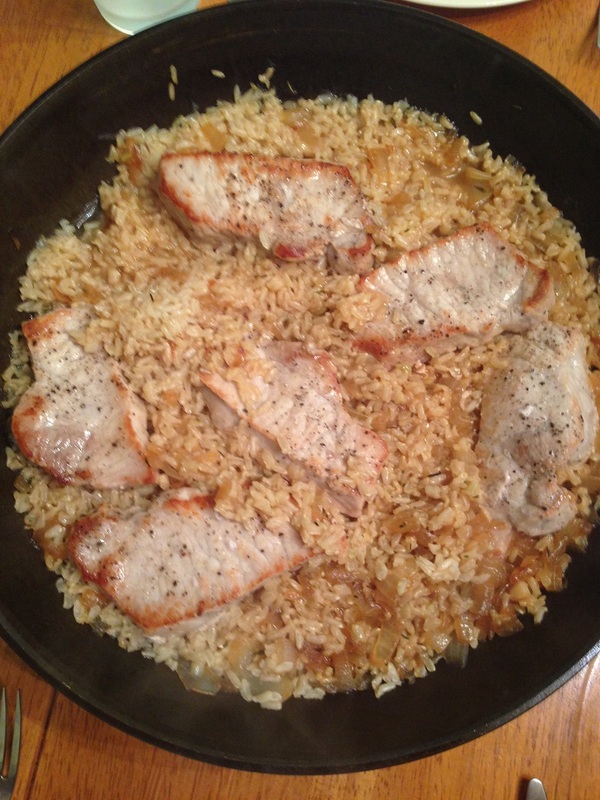 The sauce was great, giving a nice Asian flavor and flair to the dish with the ginger, soy sauce and honey. The ribs were very tender inside and crisp on the outside just the way I like them. I would definitely make this one again.